Home / Maz Repair Bio. Workshop Supervisor Maz testing a repair. What is/are your experience or qualifications? When I was 6 I figured out I had to take the wheels off my Christmas bicycle, (my first bike), so it would go in the Mini to get it home from Grandma’s. I popped it back together and went about fixing every bike I could lay my hands on, friends who lived nearby mostly. At 16 I got my first job in a bike shop with my 10yrs experience. I even taught my boss a couple of tricks. Since then I’ve run friends shops so they could have a holiday, repaired pretty much every type of HPV you can imagine and worked every aspect of the cycle trade along the way. 42yrs on and I look forward to each and every repair. 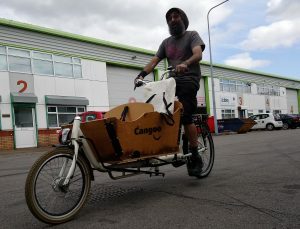 I currently supervise a bicycle recycling workshop, support and mechanic on short/long distance charity rides and have a large collection of wildly varied machinery that I take to shows and events so people can experience the more unusual cycles out there. We all know about “N + 1”, what is N equal to in your shed/house/garage/lock up? IE; How many bikes do you own? I stopped counting at 100. That was a good couple of years ago. As well as the oddities alluded to above, I collect ‘normal’ bikes of all kinds. Mostly retro stuff but anything with flair or historical (cycle) significance. Or if I just like it. Have you got a cycling hero/heroine? The late Sheldon Brown. Most definitely a kindred spirit. Any hopes or thoughts for the future of cycling, cycle sport or cycling tech? Optimistic hopes for a fundamental shift in drivers attitudes towards cyclists. If it happens, and we get some Proper infrastructure, we might just get the numbers on bikes to make a real difference to health, happiness and, just possibly, pollution levels.